Serving the communities of north Aurora, Bradford, East Gwillimbury and Newmarket. DOANE HOUSE HOSPICE HOURS OF OPERATION. Our programs and services are designed to support the individual by meeting their emotional, spiritual and physical needs. This gives the individual the ability to make the right decisions for their care, through being able to navigate the system, access the right care at the right time, and help support their family and friends through caregiver relief and bereavement. Doane House Hospice is a volunteer based organisation and part of an interdisciplinary team that works towards helping our clients live life to the fullest with dignity, hope and comfort. Please click here for a short video on Doane House Hospice. This important exhibit, showcases prints of original work produced by clients of Doane House Hospice. It will generate meaningful discussion about life and death and the transformative potential of creative expression. Learn more about this exhibit and the program in this short video. There is a lot of construction around the Doane House Hospice property -- please be careful! 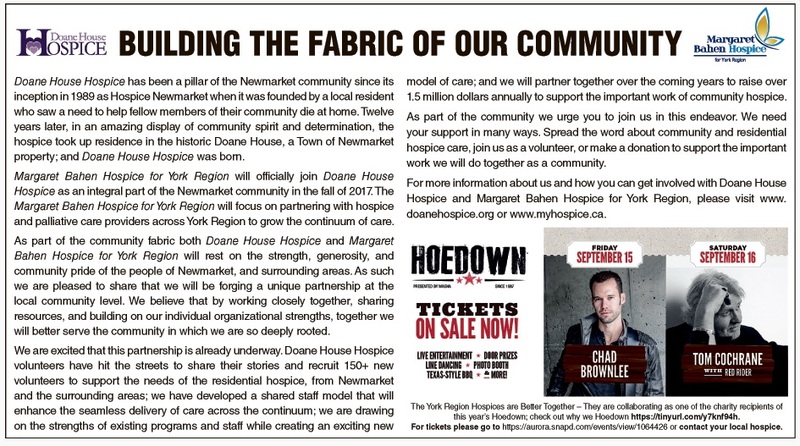 A series of 8 awareness articles about Hospice Palliative Care and services in York Region have been printed in the Era Banner. Find links to each one on the Publication page or click on the image below to go to that tab.